How should they start and end? Are they the equivalent of a short story? Is a novel a series of short stories strung together in chapters? Chapters divide a novel into sections that psychologically give readers a stopping point. They help to break up a very long story and make it visually less intimidating. They serve to assist writers with transitions, viewpoint changes, and the setting of hooks. They are usually centered around a plot event. Therefore, if an average-length novel contains roughly 20 plot events–give or take–then there will be approximately 20 or so chapters. Chapter lengths vary. Time was when chapters were lengthy, featuring perhaps two or three scenes, with sequels in between. But then James Patterson started the trend of very short chapters. His rationale was based on shortening attention spans and multi-tasking, where readers are increasingly distracted by our hectic, modern world. So you might pick up an older, midlist book where chapters run as long as ten or fifteen pages. Or you might decide to read the latest young adult bestseller, where chapters average two to five pages. The shortest chapter I can recall reading is in Ray Bradbury’s SOMETHING WICKED THIS WAY COMES. It’s one sentence long. It’s placed somewhere in the midpoint of the book for special effect, and it works beautifully as a transition and pacing change. Chapters should end with hooks. Chapters should begin with hooks, or viewpoint changes, or time/location changes. Avoid starting each chapter the same way. Avoid ending chapters with your protagonist falling asleep. Set a hook at the end to keep readers turning pages. Chapters are not short stories and should not be written in the same way. As I’ve already mentioned, they are either focused on a story event, which may involve one scene or two scenes. They may be focused on the aftermath of a major story event, where the protagonist has to pause and process what just happened. Chapter titles usually appear in fiction for young readers. They serve as a guide or a foreshadowing of what’s about to happen. In effect, they are a tiny hook to keep young readers going. Fiction for adult readers seldom requires them. In past posts, I’ve moaned about how I’ve largely had to give up used books because so many of them are musty and aggravate my allergies. And yet … sometimes the thrill of discovery is impossible to resist. After all, I was a reader long before I became a writer. The lure of reading remains strong, and I hope it always will be that way. From time to time, my heart overrides my head and I’m willing to sacrifice breathing for the chance to grab an especially intriguing tome. Of course, I have some books still residing in my freezer, stories that I long to read but may never get a chance to explore. I have books banished to the garage, books I dragged home much the way I used to bring home stray kittens. Someone ought to love these books. Someone ought to read the magical tales their covers shelter. Someone ought not to forget them or their authors, who labored long by pen or primitive little typewriter to bring these stories to life. I think these must be at a similar reading level to THE BOBBSEY TWINS series. Garis was also the author of such well-known children’s classics as UNCLE WIGGILY and THE CURLYTOPS. 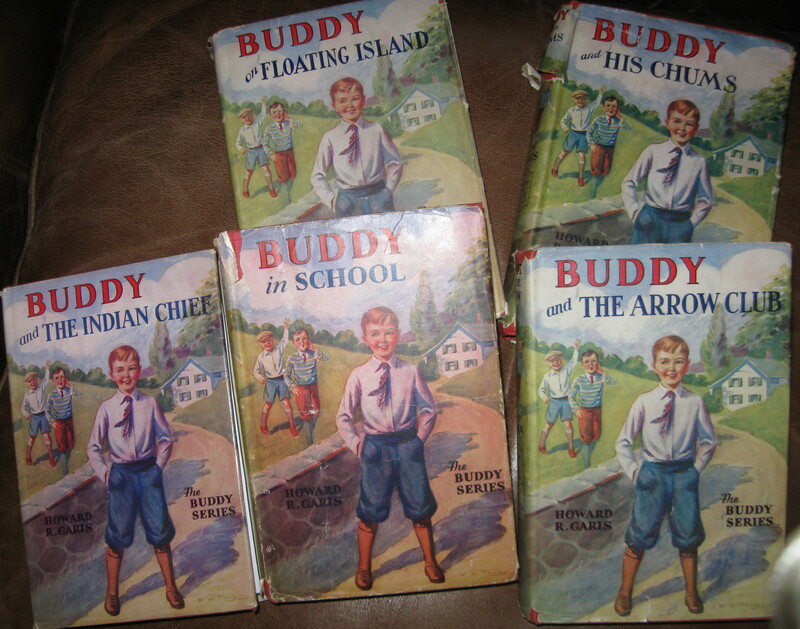 I stumbled across the BUDDY books at an estate sale. They were being sold individually instead of as a set, so by the time I arrived and fell in love, six were already gone. The collector in me howls in frustration at the loss in value a broken set represents. The reader in me is delighted to have any of them. Their dust covers and inside illustrations are charming, very much representative of an American era now gone. Notice how all the covers are identical except for the titles. Smart marketing for a small publishing house with an eye on the bottom line. Commission one cover painting and keep using it while also building brand recognition for the series. Books have always been the priceless heritage of a free people. When a new volume has been added to our shelves, it simply means that democracy and all it stands for is still at work. Take away our books, and we become slaves, unknown and unknowing. They BURNED the books in that dark land of oppression and cast into the flames not only words of beauty and knowledge, but a symbol of liberty: Man’s right to read the books of his choice. We must never let that happen here! Buy War Bonds and Stamps now so that we and our children may continue to enjoy the blessings of freedom, now and forever. So well expressed, and an important message to remember even today as America’s literacy rate slowly drops a little more each decade. Recent stories such as Markus Zusak’s THE BOOK THIEF remind us of how the Nazis sought to limit knowledge and suppress ideas through book burning. Ray Bradbury’s FAHRENHEIT 451 conveys a similar warning in a futuristic scenario. Last week, I was standing in the checkout line at Sam’s Club. A large dump at the end of the conveyer belt contained the most recent book in the DIARY OF A WIMPY KID series. A little boy of eight or ten years wanted that book so much he could barely stand it. I overheard him negotiating with his parents because the book cost $8 and he only had $6. They wouldn’t let him have the book. Something was mumbled about how he’d already chosen an item in the cart and that was that. Now I’m sure the adults were trying to teach this kid economics, but when I see a boy this age–in the demographic most at risk for dropping out of reading–denied a book, I have a hard time not butting in. I can’t express how intensely I wanted to step forward and hand the kid the two dollars he wanted. He trailed away, his head down in dejection. Five minutes later (this was a very slow-moving line), he came back with a new deal on the table. He offered to eliminate the bag of Cheetos that he’d evidently chosen earlier, and that would make up the difference in the cost of the book. I was so impressed by this child. He wanted to read a book. He figured out a solution, a reasonable one, and he made a logical pitch for it. He was willing to sacrifice junk food for a BOOK. Nope. His parents rejected the deal and kept the Cheetos. Score a point for Team Ignorance & Stupidity! In a year or two, this boy won’t care anymore. His interest in reading will have waned and died from lack of support at home. He’ll be lost to video games, probably never to read again for the rest of his life. He’ll be lazy of mind, low of imagination, and ripe for believing biased media sound bytes. Even if we don’t have Nazis burning books these days, another way to destroy the knowledge and freedom of thought that derive from reading is to trample the desire to read. Granted, there’s nothing deep or profound about the WIMPY KID series. I doubt there’s much that’s deep or profound about the vintage BUDDY series either. But their value lies in that they’re fun and entertaining. And as you and I know, fun reading can lead to the willingness to tackle more challenging books and insightful ideas. He knew his audience, and he respected these young readers enough to acknowledge their effort toward winning the war. Because, after all, everyone matters no matter how small, how young, or how humble. Meanwhile, I plan to tackle the volume dated 1929 first. They aren’t musty–hurray! Long ago in the far away of my writer’s training, I was taught to focus on my plot, write it according to valid story principles, and relax in the knowledge that chapters would take care of themselves. But although this Zen approach works for me, I’m asked about chapters enough to realize that not everyone understands what chapters are, what they do, why they’re structured as they are, and what their purpose is. Now I haven’t bothered to research the history of chapters or when they first came about in the musty tomes of past literature, but my guess is that they were devised to aid readability, just as the Bible was divided into chapters and verses at some point. If the family gathered around the light of a candle in the evening and listened to someone reading aloud, chapter breaks were useful in providing a stopping point so that weary folks could go to bed. Modern authors have put a different spin on this by building in hooks and plot twists to make it difficult for a reader to stop at the end of a chapter. We want readers to remain enthralled, unable to put the book down. So what, then, is the structure? These days, scenes and chapters alike are growing shorter. Why? We live at a faster clip. We are inundated with more and more information–valid and useful, or not–and much of what we encounter is telegraphic to fit tweets and sound bytes. Okay. Let’s simplify the topic. Don’t worry about whether you have a one-scene chapter, a one-sequel chapter, or a combination of the two types of dramatic units. Instead, think about a chapter as a division of story that opens with a grab for the reader’s attention and builds to a hook at its conclusion. The chapter’s content should span a single event that’s written as a scene of conflict. Or it should span a series of incidents related in narrative summary where the protagonist is pursuing some objective. For example: Let’s say Paul Protagonist wants his mother to loan him her house in the Hamptons so he can throw a big party. He calls her. No answer. He texts her. No answer. He drops by her Park Avenue apartment, but she’s not at home. The manservant tells him that she’s at her favorite spa, getting a facial. So he goes there and finally tracks her down. Coated in mud and up to her neck in a boiling hot tub, Mom peels the cucumber slice off one eye and glares at him. Okay, this is admittedly a very silly example, but it demonstrates how Paul has pursued his objective in several ways through scene and narrative clustered around the common goal of finding his mother. Now, because she won’t cooperate, he must form a new objective and decide whether he’s going to approach the vampire neighbors or do something else. But that should fall into a new chapter.